Here’s a dogged tale, then. Over in the UK, the Royal Society for the Prevention of Cruelty to Animals (RSPCA) has partnered with Volkswagen Commercial Vehicles to teach rescue dogs to drive. Over the past two months, three mixed-breed dogs – Tulip, Jacob and Harry (no idea which is which in the photo) – have been taught to drive a Volkswagen Amarok by the animal welfare charity. 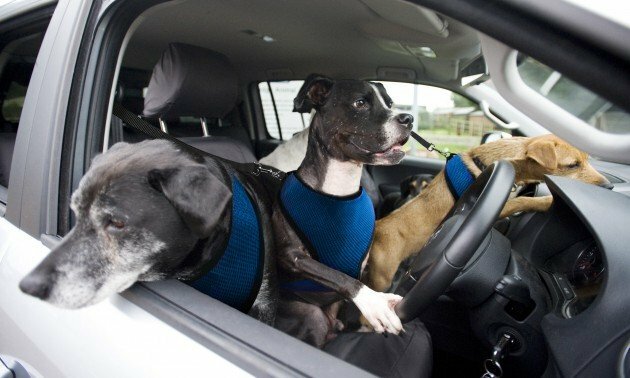 The canines, trained at the Southridge RSPCA centre in Hertfordshire, have learned to control the brakes, gears and even the steering wheel. The dogs were initially taught to steer using a wooden trolley pulled along with string. 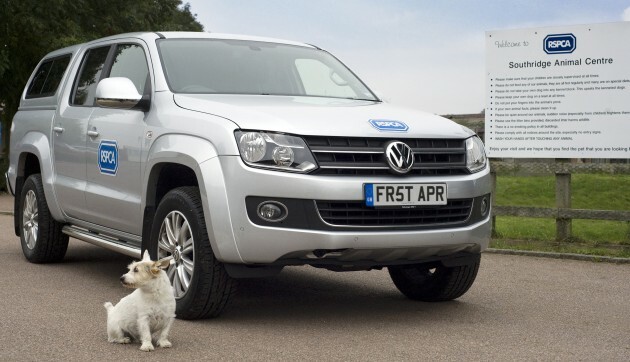 Mock car controls were then introduced before the dogs were trained to wear specially-adapted safety harnesses and put behind the wheel of the 180 PS Reflex Silver Amarok, which bears the interesting number plate FR5T APR. The animals then spent hours practising their driving skills while sitting alongside a human instructor, who has access to separate controls. To allow the dogs to drive the Amarok, their front paws rest on the steering wheel and the gearstick, while their rear paws rest on purpose-built extension levers that are attached to the accelerator and brake pedals. In 2012, three dogs called Ginny, Porter and Monty had the honour of being the first to accomplish the deed in New Zealand – Porter holds the title of being the world’s first driving dog, behind the wheel of a MINI. So who says you can’t teach old dogs new tricks, eh? While this is clearly a joke, the best joke so far are people using their VW DSG transmission. So funny la see them waiting for tow truck on the highway. Everytime I exit Damansara NKVE for Subang, I see their billboard telling me to stop and admire. Yes, the VW is parked there not because it wants you to admire, but because it is waiting for the tow truck due to DSG failure. Even more funny: VW will open a new plant in Thailand and not Malaysia. My cat Manny, was also trained to ride a Duc Diavel. With the help from his friend, Rocky the Hamster. They rode together every 1st April of a year. bila amarok nk masuk malaysia?